Okay, okay. Took me some doing, but I finally got this done. Really wanted to use a free tent, but I couldn't find anything that fit with the way I wanted it to go, so I had to use a paid one. Done in Daz3A. Postwork to add signature. "Come in! Come in! See the AMAZING Unicorn! Marvel at the ONE AND ONLY Cerebus!" I'm having a bit of trouble with #10 and #16. That said the others still put you over the top. Entry Accepted. Thank you for joining this month. WOW!...Just so many cool renders entered this month. I have been a busy beaver with real life, but I have not abandoned you guys. IN FACT....just the opposite. I have a little surprize for you all. I have been working with the Daz team and Cho behind the scenes and with a little patients, we have come up with a little treat. Starting next month, in the February challenge, Daz will once again be rewarding the winners of the challenge with prizes. With the re-sponcership of our beloved leaders, they will be awarding "Gift Certificates" to the Daz store, to the three winners of the challenge. No vouchers, GCs. I feel lucky we were able to get this going since the change over. Though we will no longer be giving any to "honorable mentions", they will still be given any donation prizes by third parties. Only the three main winners will receive GCs. So, you will have to work a little harder to win these. These will be awarded to the winners at the end of each month when they are chosen. It has been a long hard road to get this site working, and the team has been burning their candles at both ends, and dedicating hour after hour to try to please all you nuts here at the site. They have been almost giving away their store products as well as PAs bending their prices to help. I have never seen so many deals going on here for folks. They are some good people. So, show your love to them by participating in the challenge, and browsing the store from time to time for some great deals. Thank them if you get the urge, I am sure they would love to hear that from some of you guys, they have really worked hard and deserve it. So, it is official...starting February 1, 2013 Daz will be sponcering us again with the giving of GCs to our three main winners. Anyone who is chosen as a winner, MUST PM ME WITH THEIR EMAIL ADDY THEY USED WHEN THEY REGISTERED HERE AT THE DAZ SITE to receive their GCs. Thank all of you who enter. AWESOME... thank you DAZ you are rock-stars, and you too music for doing this for us. edited to add chohole to the thank you list for her help at getting this accomplished too. I just tried both and had no troubles at all. Darn EDIT TIME. Yes Dana you are right. I had some connection issues at the time of that post. They ALL check out 100% now. I'm sorry for not checking this before now but I didn't. The Render is still Approved and Still loved. All links check. Thanks for the double check Dana. I never would have known without you pointing this out to me. A Reboot fixed it. Okay folks the Votes are in for the Mini Contest. I'll let you all know as soon as I learn to add 1+1. That might take till tomorrow, so hang in and see who is who at the same time I do. Well, that is a funny one! Well done! You mean he didn't fool you? Back to the drawingboard, boys! Let's get some paint on that horn and some articulation in those heads! Goodness, you gave me a fright there as I'd checked the links just before posting my entry. Yes, I too wish to Thank Daz for their generosity. But, mostly I want to Thank everyone who takes their valuable time to host and judge these contests. I recently entered another contest not knowing the entrants were the ones voting at the end. It takes more effort than I had realized in trying to apply values to the entries to determine best picks. It's one thing to look at an image and say 'oh, that is nice' or 'wow, I like this about that', but when you know your opinion matters to so many it truly puts a different perspective on the creativity that goes into each piece of artwork being judged. thanks Zawarkal, I have judged many times and hosted a few as well, (being an ETO we do that alot), judging is very difficult in here, in this forum we look at how well the theme was followed as well which is why I like it here so much, anyone can win. And it never ceases to amaze me at what people come up with in their interpretation of that month;s theme. Wow Wonderful to hear the great news for the contest. And Speaking of Contests we now have a Winner for the Mini Contest Pet's Tricks. Luci45 and The Old Pet Doesn’t Like the New Pet’s Trick was the top pick. Well done and Congrad. EDIT! We now have GC's and I went ahead and covered the Contest so the Prizes will be Awarded in PM's only this month from me. Luci45 please Check your PM's and get back to me. ( In the voice of Yosimity Sam ) "Ok folks listen up, cause I'm a only gonna say this once....well maybe twice...or three....ahhhh never mind that..."
There will be a time limit of ONE WEEK, FROM THE MOMENT THE WINNERS ARE ANNOUNCED, TO GET YOUR EMAIL ADDY TO ME FOR ME TO SEND THE WINNERS IN FOR THEIR GCs. IF YOU MISS IT, YOU MISS THE TRAIN AND FORFEIT YOUR WINNINGS!. This will keep things running smoothly on the DAZ end. This is a must, and NO EXCEPTIONS. If your grandma dies, send it before they put her in the ground...if your dog dies...same thing. If you die...well, there is the exception!!!! NO! You still miss the train. ok...just so everyone understands...you got one week to get 'um in to me. Oh man! So If I have a Heart attack and pass after I see my Grandma die while shes killing ma dawg (Never liked the Bity Suma gun much anyway) I'm goona miss out? 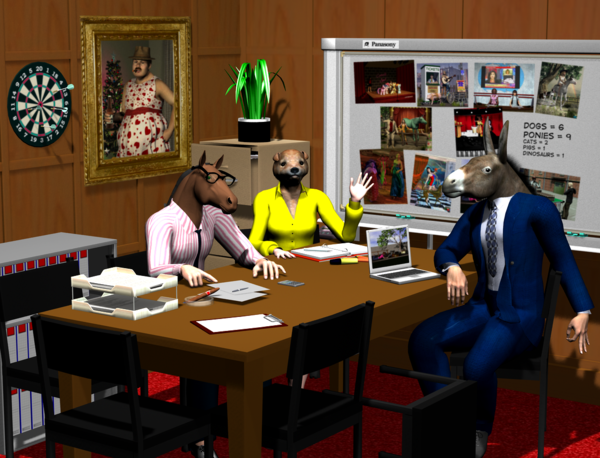 so you're saying that rob is a jackasss, cho looks like a horse and I'm at .... what ????? I think it's supposed to be a dog. Remember, I didn't make that image! I'm just telling you what it looks like. I meant the depictions in the nicest possible way, I assure you. 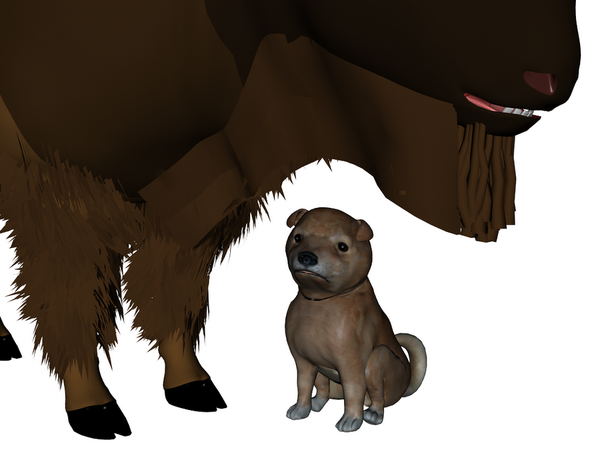 That's the Shiba Inu Puppy from Edogoyomi with the Mil Horse and another of my rare purchases, the donkey (and now the bison) from the "Good Bad & Ugly" pack by Debra and Silverkey 3D at DAZ. Have been very busy at home and work this week. Sorry to not get an entry in. Liked the topic! But how did you know I wear glasses?